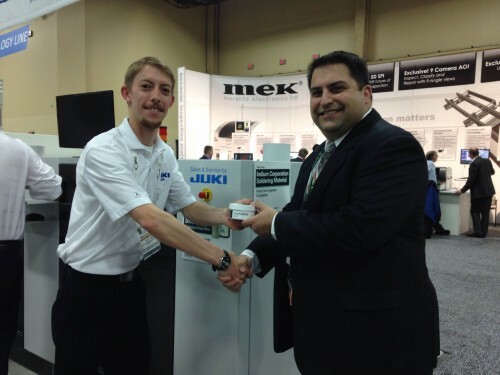 (From left to right): Bryce Timms of Juki and Mario Scalzo of Indium Corporation at APEX 2014. This year marks the 10th anniversary of Live at APEX. Indium Corporation is pleased to announce the 10th anniversary of its Live at APEX program. Live at APEX is the joint effort of Indium Corporation and its industry partners. Developed as a means of accurately and honestly depicting the performance of the company's materials and processes, the program places Indium Corporation products into live equipment demonstrations on the APEX show floor. Today, the Live at APEX program has expanded to encompass a full 10 percent of the exhibitors, each running Indium Corporation products in their booth. This means that Indium Corporation products can be seen in a live production environment in 20 industry partner exhibit demonstrations. Mario Scalzo, senior technical support engineer, has chaired the program for the past seven years. Scalzo has worked on hundreds of factory floors, formulated solder pastes and fluxes, done the manufacturing, performed the tests and run the trials, giving him a full understanding of both the materials and the needs of the customers. Through his efforts, the program has expanded beyond just solder paste to include products such as fluxes, solder preforms, solder wire, and more. The key ingredients to the success of this program are teamwork and collaboration. This program benefits all the participants – Indium Corporation, the industry partners, and most importantly, the customer, who gets to see and experience the equipment and materials in a live action environment. Indium Corporation materials will be featured at these exhibits during APEX: Yamaha, Finetech (Martin), Smart Sonic, American Hakko, Apollo Seiko, Metcal, GPD Global, Juki, Speedline Technologies, Apex Factory Automation, ASYS Group, CyberOptics, DEK, Air-Vac, Pillarhouse, Quik-Tool and more. To learn more about the Live at APEX program, contact Mario Scalzo or visit Indium Corporation at booth #1977.